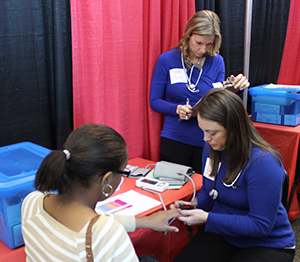 Eight volunteer physicians are still needed to assist at the Louisville MedFest, scheduled for Oct. 27 at the Brown and Williamson Club at Louisville’s Papa John’s Cardinal Stadium. Physicians provide sports physicals for the Jefferson County Public School special needs students who participate in MedFest. The physical qualifies students to participate in Special Olympics competitive events. Physicians must be licensed and can be doctors, physicians assistants or nurse practitioners. The time commitment is from 9 am until approximately 2 pm on Oct. 27. MedFest is a one-day health fair for qualifying students. In addition to the sports physical, students can receive vision, dental and hearing screenings at the event, and when needed students will receive referrals for further care. For more information or to volunteer, contact Kim Satterwhite at 502-695-8222 or via e-mail at ksaterwhite@soky.org.